The opening track on the Rolling Stones' fourth album Aftermath (1966), "Paint it Black" is one of the most famous songs by the English rock band, reaching the number one spot in both the Billboard Hot 100 and UK Singles Chart. Popular for its psychedelic rock sound, the song's dark and mysterious lyrics also probably have a lot to do with the song's continuing popularity. What is the meaning of "Paint It Black" by the Rolling Stones? "That was the time of lots of acid. It has sitars on it. It's like the beginnings of miserable psychedelia." Mick Jagger on "Paint it Black"
"Paint It Black" may have been partly inspired by just another bad acid trip, but it also isn't difficult to connect the meaning of the song to the Vietnam War, especially since the song was released in 1966 while the war was in full swing. However, much of the song's connotations with the Vietnam War have been imposed after the fact by outside sources. "Paint it Black" plays over the closing credits in Stanley Kubrick's Vietnam movie Full Metal Jacket, released in 1983. The song was also used as the theme song for the CBS series Tour of Duty, a TV show about Vietnam War that aired from 1987-1989. Why is the meaning of "Paint It Black" so often associated with the Vietnam War? War is never directly referenced in "Paint it Black," but the depressed song lyrics echo feelings shared by many during the Vietnam Warâ€”civilians and soldiers alike. By the time the song "Paint it Black" was released in 1966, public opinion was already turning against the Vietnam War, which for many seemed to drag on endlessly with no end in sight. By 1970, the majority of Americans believed that the U.S. had made a mistake by sending so many troops to fight and die pointlessly in Vietnam. War and all of the death caused by it were definitely on people's minds. With flowers and my love, both never to come back." Coping with death was a part of daily life during the Vietnam War, and death and grief show up clearly in the first verse of "Paint it Black" in the form of a funeral. For most people, funerals are not an everyday occurrence, but in "Paint it Black" death seems to be just as much a part of day-to-day life as a "newborn baby." As Mick Jagger sings, "It just happens every day." The narrator stoically looks on as a hearse and the other black cars in a funeral procession carry "flowers" and his "love" to a cemetery for burial. 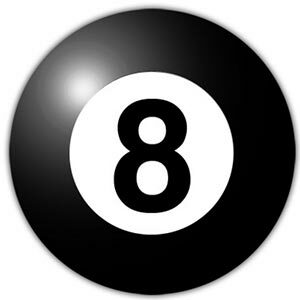 That brings us to the question: who is the narrator of "Paint it Black"? At first glance, it seems that the narrator of "Paint it Black" is just a young man struggling with depression and grief after the death of his girlfriend. Like a moody teenager, he wants to paint everything black to match the way he feels inside. This desire for absolute blackness peaks in the song's outro when the singer goes into a full-on temper tantrum, expressing his fervent desire to see the "sun blotted out of the sky" in a fully encapsulating apocalyptic darkness of borderline Biblical proportions. Is this really just your typical teenage angst? This might be the voice of a teenager struggling to get over the loss of his first love, but there may be more to it. While the narrator could be just another depressed civilian kid, it is also possible that he is in fact a young soldier just returned home from Vietnam. After witnessing so much death in the war, observing another funeral back at home may be enough to push him over the edge. The way he sees it, the hearse might be taking much more than the body of a lover — it may be symbolically carrying away his heart, or ability to love and feel altogether. Depression was widespread amongst the veterans of the Vietnam War. In fact, so many Vietnam veterans returned from the war with similarly negative psychological side effects that the healthcare industry was forced to come up with a name for this new phenomenon. In the 1970s, the term "post-traumatic stress disorder" (PTSD) came into use in large part due to the diagnoses of US military veterans of the Vietnam War. Veterans who witnessed the widespread bloodshed and trauma of the Vietnam War firsthand often became psychologically overwhelmed, sometimes not fully recovering if and when they were lucky enough to make it home after the war. Like a veteran suffering from PTSD and depression, the narrator of "Paint it Black" is no longer entertained by the little things that used to amuse him back at home, like seeing girls "dressed in their summer clothes." Instead of flirting and having fun with the ladies he sees out and about, he turns away aloofly, suddenly overwhelmed by the "darkness" of his memories. I see people turn their heads and quickly look away." The depressed narrator of "Paint it Black" is clearly pushing people away, but there is also reason to believe that the people back at home aren't exactly welcoming him with open arms, either. While World War II veterans were mostly regarded as heroes at their homecoming, soldiers returning from Vietnam were often alienated or, even worse, met with anger and disdain, sometimes being yelled at and even spit on by people who specifically blamed them for the war. In "Paint It Black," the narrator also sees this unfeeling side of people as they coldly "turn their heads and quickly look away," only adding paranoia to his mounting feelings of isolation and alienation. It's not easy facing up when your whole world is black." A Song About Drugs? Analysis of 1960s Counterculture & "Paint it Black"
As Mick Jagger suggested, drugs do play a part in understanding the meaning of "Paint it Black." Like many veterans coping with PTSD, the song's overwhelmed narrator struggles to overcome the darkness he sees not just in himself, but in the "whole world" around him. With everyone at home looking the other way, like so many he also turns to drugs, hoping to "fade away" into a psychedelic reverie where he can ease his pain and maybe even find "love" and happiness again. Obviously, turning to drugs and alcohol to escape the tumultuous times of the 1960s wasn't something that only Vietnam veterans did. Many young people felt discontent with mainstream culture, and drugs were one way to escape. While the Vietnam War is important to understanding the meaning of "Paint it Black," it was not the only political upheaval going on in the turbulent 1960s. The Civil Rights Movement was also in full swing, and for African Americans the two were very connected. 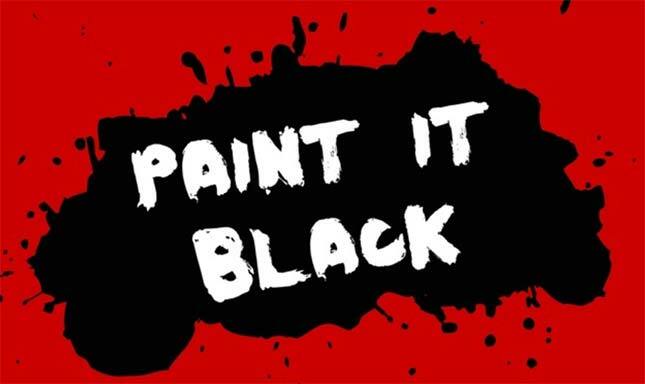 In fact, in the first printing of the single "Paint it Black," on the cover the title was accidentally transcribed as "Paint It, Black," reading as a command to manual labor for all African Americans. The errant comma was later removed by the record company Decca Records, but the punctuation error added a mysterious and racially charged new meaning to a song already rife with social commentary. 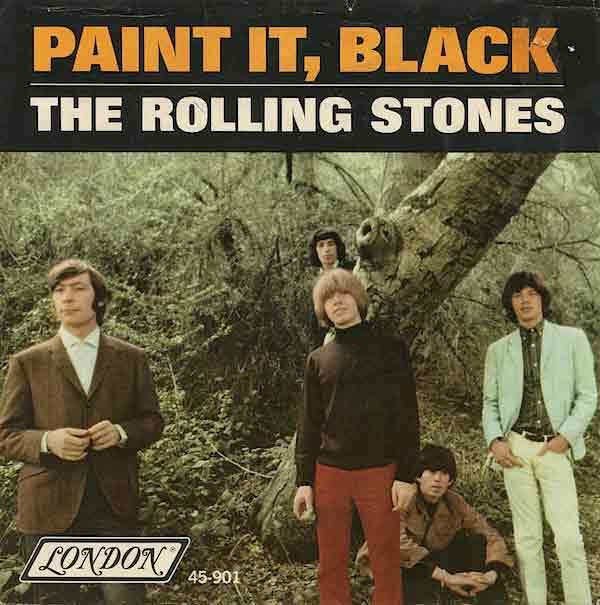 In the end, the meaning of "Paint it Black" by the Rolling Stones is up for interpretation. While Mick Jagger suggested that the song's meaning is inconsequential and perhaps influenced by drug use, "Paint it Black" endures as a rock and roll song because it has so many layers of meaning that indirectly connect with the experiences of a variety of different people living and struggling in an era of political uncertainty: Vietnam veterans and mourners, young members of the counterculture, Black Americans struggling during the Civil Rights movement and anyone experiencing a sense of restlessness and dissatisfaction during a tumultuous time in American history.